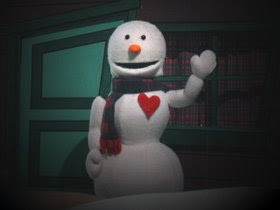 Actually, it's based on The Snow Man, by Hans Christian Andersen and it's hilarious, heartwarming and perfect for kids (I actually out Andersen in my book). Nov 18-26, 2008: Tues-Fri @ 10:30am & 12pm; Sat @ 11am, 1pm & 3pm; Sun @ 1pm & 3pm. Nov 28-30, 2008: Fri & Sat @ 11am, 1pm & 3pm; Sun @ 1pm & 3pm. Dec 2-7, 2008: Tues-Fri @ 10:30am & 12pm; Sat @ 11am, 1pm & 3pm; Sun @ 1pm & 3pm. Dec 9-21, 2008: Tues-Fri @ 10am & 11:30am; Sat @ 11am, 1pm & 3pm; Sun @ 1pm & 3pm. Dec 23, 2008 – Jan 4, 2009: Tues-Fri @ 10am, 12pm & 2pm; Sat @ 11am, 1pm & 3pm. Sun @ 1pm & 3pm. Closed: Nov 27, 2008; December 25, 2008; January 1, 2009. Tickets for patrons ages 2 and older are $14.82 + tax for the general public (the ticket price includes a performance, the Create-A-Puppet Workshop, and admission into the permanent Museum exhibit Puppets: The Power of Wonder and special exhibits including the brand new Jim Henson: Wonders from His Workshop). 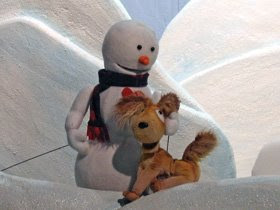 Order your tickets “FEE-FREE” online at www.puppet.org or call the Ticket Sales Office at 404.873.3391. The Ticket Sales Office is open Monday through Saturday from 9am – 5pm and Sunday 11am – 5pm, with extended hours during evening performances. The Center is located in Midtown Atlanta, across the bridge from Atlantic Station, is accessible from MARTA, and has limited free parking.